Arun has over 15 years of HR experience in various sectors such as hotels, airlines, retail and facility management. 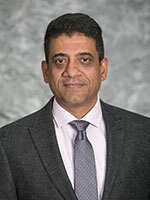 Arun holds a Master of Arts in Leadership from Royal Roads University, and a Diploma in Hotel Administration from the Sophia Polytechnic in Mumbai, India. He is a Chartered Professional in Human Resources (CPHR) and has completed management programs in HR at both BCIT and the Indian Institute of Management. Arun leads the development and implementation of industry recruitment and retention strategies and tactics in alignment with the BC Tourism Labour Market Strategy.